Slipstream Creative is an auto dealer focused digital marketing company that specializes in helping car dealerships grow their business through web-based initiatives. From an Ahead-of-the-curve Dealership Website Platform, to Advanced VIdeo SEO/Marketing, to Digital Ad Campaings and a Turnkey Reputation Management Solution - Slipstream prides itself on developing game-changing technology solutions that help your dealership dominate your market; generate more leads, close more sales, and build long-term customer loyalty in a changing dealer world. 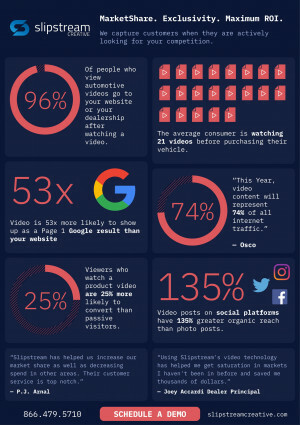 If you are looking for a "True" digital partner that will facilitate a successfull long-term growth strategy while driving short term goals, then Slipstream Auto is the answer.